Tryptophan is an α-amino acid that is found in most proteins and has an indole functional group as a distinguishing structural characteristic. It is a precursor to the neurotransmitter serotonin and the vitamin niacin (also known as nicotinic acid or vitamin B3). In humans, the L-isomer of tryptophan, which is the only form that is involved in protein synthesis, is one of the 20 standard amino acids common in animal proteins and required for normal functioning in humans. Tryptophan is also classified as an "essential amino acid" since it cannot be synthesized by the human body from other compounds through chemical reactions and thus has to be taken in with the diet. Tryptophan, tyrosine, and phenylalanine are the biggest of the standard amino acids. In general, essential amino acids require that human beings exercise personal responsibility and self-discipline in their diets and relate with a variety of other plants and animals for their nutritional needs. Nutritional supplements of L-tryptohan were taken off the market in the United States at one point due to some being linked to the disability disease eosinophilia-myalgia syndrome (EMS). This disease largely was attributed to contaminates traced to one manufacturer, who, to save production costs, took some liberties in the manufacturing process. Tryptophan's three letter code is Trp, its one letter code is W, its codon is UGG, and its systematic name is 2-Amino-3-(lH-indol-3-yl)-propanoic acid (IUPAC-IUB 1983). Tryptophan is one of only two of the standard amino acids encoded by a single codon, with methionine being the other one. where R represents a side chain specific to each amino acid. Most amino acids occur in two possible optical isomers, called D and L. The L amino acids represent the vast majority of amino acids found in proteins. They are called proteinogenic amino acids. As the name "proteinogenic" (literally, protein building) suggests, these amino acid are encoded by the standard genetic code and participate in the process of protein synthesis. In tryptophan, only the L-stereoisomer is involved in synthesis of mammalian proteins. However, the D-stereoisomer is occasionally found in natural materials, such as the marine venom peptide contryphan (Pallaghy et al. 1999). Tyrptophan's chemical formula is C11H12N2O2. Tryptophan behaves similarly to phenylalanine and tyrosine. Like these two amino acids, tyrptophan contains a large rigid aromatic group on the side chain. Tyrptophan, tyrosine, and phenylalanine—like isoleucine, leucine, and valine—are hydrophobic and tend to orient towards the interior of the folded protein molecule. The fluorescence of a folded protein is a mixture of the fluorescence from individual aromatic residues. Most of the intrinsic fluorescence emissions of a folded protein are due to excitation of tryptophan residues, with some emissions due to tyrosine and phenylalanine. Typically, tryptophan has a wavelength of maximum absorption of 280 nm and a wavelength of maximum fluorescence emission of 350 nm. However, these fluorescence parameters are strongly dependent on the environment that the tryptophan residue is in, for example the degree of solvent exposure (Brooks 2007). Hence protein fluorescence may be used as a diagnostic of the conformational state a protein (Vivian 2006). Furthermore, tryptophan fluorescence is strongly influenced by the proximity of other residues (i.e., nearby protonated acidic groups such as aspartic acid or glutamic acid can cause quenching of Trp fluorescence). In addition, tryptophan is a relatively rare amino acid, therefore many proteins contain only one or a few tryptophan residues. Thus, tryptophan fluorescence is a very sensitive measurement of the conformational state of individual tryptophan residues. As an essential amino acid, tryptophan is not synthesized in humans, hence it must be ingested, usually as a component of proteins. Fortunately, it is found in most proteins, albeit in small amounts. Major sources include legumes, milk, yogurt, cottage cheese, red meat, eggs, fish, poultry, chocolate, oats, bananas, dried dates, sesame, chickpeas, sunflower seeds, pumpkin seeds, spirulina, and peanuts. Intestinal bacteria in humans break down tryptophan into two chemicals, indole and skatole. The disorders fructose malabsorption and lactose intolerance cause improper absorption of tryptophan in the intestine, reduced levels of tryptophan in the blood and depression (Ledochowski et. al 2001). The principle function of amino acids, including tryptophan, are as building blocks in protein biosynthesis. In addition, tryptophan functions as a biochemical precursor for the production of the neurotransmitter serotonin (via tryptophan hydroxylase) and the vitamin niacin (with kynurenine as an intermediate). Serotinin, in turn, can be converted to melatonin (a neurohormone), via 5-hydroxyindole-O-methyltransferase. Conversion of tryptophan to niacin is insufficient to meet the demands for this vitamin. Lack of tryptophan, however, such as dependence on food of low tryptophan content such as maize, can contribute to the niacin-deficiency disease pellagra. In organisms which synthesize tryptophan (plants and microorganisms), high levels of this amino acid activate a repressor protein, which in turn binds to the trp operon. Binding of this repressor to its operon prevents transcription of downstream DNA that codes for enzymes involved in the biosynthesis of tryptophan. Hence, high levels of tryptophan prevent additional tryptophan synthesis through a negative feedback loop. Conversely, if the cell's tryptophan level drops, transcription of the operon's genes resumes. This is one example of how gene expression responds rapidly to changes in the cell's internal and external environment. Metabolism of L-tryptophan into serotonin and melatonin (left) and niacin (right). 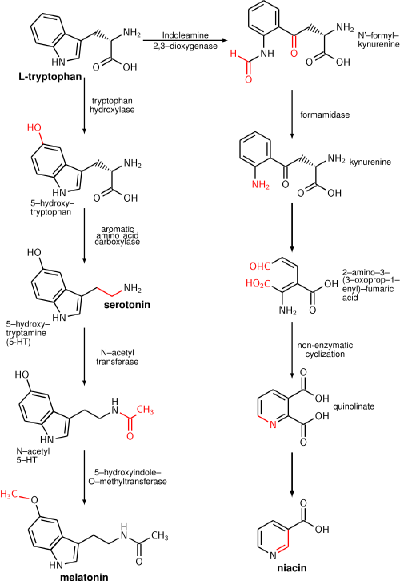 Transformed functional groups after each chemical reaction are highlighted in red. For some time, tryptophan was available in health food stores as a dietary supplement. It was largely taken out of the market in 1991 due to health concerns (discussed below), but since 2002, L-Tryptophan has been sold again in its original form. Many people found tryptophan to be a safe and reasonably effective sleep aid, probably due to its ability to increase brain levels of serotonin (a calming neurotransmitter when present in moderate levels) and/or melatonin (a sleep-inducing hormone secreted by the pineal gland in response to darkness or low light levels) (Wurtman et al. 1968). Clinical research tended to confirm tryptophan's effectiveness as a natural sleep aid and for a growing variety of other conditions typically associated with low serotonin levels or activity in the brain. In particular, tryptophan showed considerable promise as an antidepressant alone, and as an "augmenter" of antidepressant drugs. Other promising indications included relief of chronic pain and reduction of impulsive, violent, manic, addictive, anxiety-related, obsessive, and compulsive behaviors and disorders. In 1989, a large outbreak of a new, disabling, and in some cases deadly autoimmune illness called eosinophilia-myalgia syndrome (EMS) was traced to one source of L-tryptophan. The bacterial culture used to synthesize tryptophan by a major Japanese manufacturer, Showa Denko KK, had been genetically modified several times to increase tryptophan production during the 1980s (Smith 2003). Along with the higher tryptophan concentrations in the modified culture media, the purification process had also been streamlined to reduce costs, and a purification step that used charcoal absorption to remove some impurities had been omitted (Mayeno and Gleich 1994). The manufacturer maintained that this process modification allowed another bacterial metabolite through the purification, resulting in the presence of an end-product contaminant responsible for the toxic effects. The U.S. Food and Drug Administration was unable to publicly establish with certainty what contaminant was the cause of the outbreak. "Based on the scientific evidence that is available at the present time, we cannot determine with certainty that the occurrence of EMS in susceptible persons consuming L-tryptophan supplements derives from the content of L-tryptophan, an impurity contained in the L-tryptophan, or a combination of the two in association with other, as yet unknown, external factors"(FDA 2001). 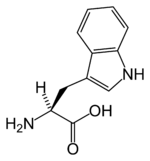 A metabolite of tryptophan, 5-Hydroxytryptophan (5-HTP), has been suggested as a treatment for epilepsy (Kostowski et al. 1978) and depression though clinical trials are inconclusive and lacking (Turner et al. 2006). 5-HTP readily crosses the blood brain barrier and in addition is rapidly decarboxylated to serotonin (5-hydroxytryptamine or 5-HT) (Hardebo and Owman 1980) and therefore may useful for the treatment of depression. However serotonin has a relatively short half life since it is rapidly metabolized by monoamine oxidase; therefore, it is likely to have limited efficacy. It is marketed in Europe for depression and other indications under brand names like Cincofarm and Tript-OH. In the United States, 5-HTP does not require a prescription as it is covered under the Dietary Supplement Act. Tryptophan has continued to be used in clinical and experimental studies employing human patients and subjects. Several of these studies suggest tryptophan can effectively treat the fall/winter depression variant of seasonal affective disorder (Jepson et al. 1999). According to popular belief, eating tryptophan in turkey meat causes drowsiness. Turkey does contain tryptophan, which does have a documented sleep-inducing effect as it is readily converted by the body into serotonin and/or melatonin, which have a sedative effect as noted above. However, ingestion of turkey alone has not been proven to have this effect. Furthermore, chicken and ground beef are considered to have similar levels as turkey (McCue 2001). Some attribute the sleepiness to overeating of carbohydrates and alcohol consumption during feasts. An additional hypothetical mechanism is as follows. A large quantity of any food, such as a Thanksgiving feast, introduces large quantities of both carbohydrates and branched-chain amino acids releasing insulin. Insulin stimulates the uptake of large neutral branched-chain amino acids (and not tryptophan) by muscle cells through the myocyte membranes. The result is an increase in the ratio of tryptophan to large neutral amino acids in the blood. This reduces competition with other amino acids for the Large Neutral Amino Acid Transporter protein for uptake of tryptophan across the blood-brain barrier into the central nervous system. Once inside the central nervous system, tryptophan is converted into serotonin by the raphe nuclei, and serotonin is further metabolized into melatonin by the pineal gland. Alcoholic beverage consumption at holiday feasts is likely to compound the effect. Beisler, J. H. 2000. Dietary supplements and their discontents: FDA regulation and the Dietary Supplement Health and Education Act of 1994 (L-tryptophan Section). Rutgers Law Journal. Retrieved June 28, 2007. Brooks, D. W. 2007. Intrinsic fluorescence of proteins and peptides. Brooks teaching and research website. Retrieved June 29, 2007. Food and Drug Administration. 2001. FDA information paper on L-tryptophan and 5-hydroxy-L-tryptophan. FDA. Retrieved June 28, 2007. Food and Drug Administration. 1990. FDA tryptophan recall. FDA. Retrieved June 28, 2007. Hardebo, J. E., and C. Owman. 1980. Barrier mechanisms for neurotransmitter monoamines and their precursors at the blood-brain interface. Ann NeurolAnn Neurol 8(1): 1-31. PMID 6105837. Retrieved February 19, 2013.
International Union of Pure and Applied Chemistry and International Union of Biochemistry and Molecular Biology (IUPAC-IUB) Joint Commission on Biochemical Nomenclature. 1983. Nomenclature and symbolism for amino acids and peptides: Recommendations on organic & biochemical nomenclature, symbols & terminology. IUPAC-IUB. Retrieved June 14, 2007. Jepson, T. L., M. E. Ernst, and M. W. Kelly. 1999. Current perspectives on the management of seasonal affective disorder. J Am Pharm Assoc 39(6): 822-829. PMID 10609448. Retrieved February 19, 2013. Kostowski, W., A. Bidzinski, M. Hauptmann, J. E. Malinowski, M. Jerlicz, and J. Dymecki. 1978. Brain serotonin and epileptic seizures in mice: A pharmacological and biochemical study. Pol J Pharmacol Pharm 30(1): 41-47. PMID 148040. Retrieved February 19, 2013. Ledochowski M, Widner B, Murr C, Sperner-Unterweger B, Fuchs D. 2001. Fructose malabsorption is associated with decreased plasma tryptophan. Scand J Gastroenterol. Apr;36(4):367-71. PMID 11336160. Retrieved February 19, 2013. Lehninger, A. L., D. L. Nelson, and M. M. Cox. 2000. Lehninger Principles of Biochemistry, 3rd ed. New York: Worth Publishing. ISBN 1572591536. Mayeno, A. N., and G. J. Gleich. 1994. Eosinophilia-myalgia syndrome and tryptophan production: A cautionary tale. Trends Biotechnol 12(9): 346-352. PMID 7765187. Retrieved February 19, 2013. McCue, K. 2001. Thanksgiving, turkey, and tryptophan. American Chemical Society. Retrieved June 29, 2007. Pallaghy, P. K., A. P. Melnikova, E. C. Jimenez, B. M. Olivera, and R. S. Norton. 1999. Solution structure of contryphan-R, a naturally occurring disulfide-bridged octapeptide containing D-tryptophan: comparison with protein loops. Biochemistry 38(35): 11553-11559. PMID 10471307. Retrieved February 19, 2013. Raphals, P. 2000. Does medical mystery threaten biotech? Science 250: 4981. PMID 2237411. Retrieved February 19, 2013. Smith, J. M. 2003. Seeds of deception: Exposing industry and government lies about the safety of the genetically engineered foods you're eating. Fairfield, IA: Yes! Books. ISBN 9780972966580. Turner, E. H., J. M. Loftis, and A. D. Blackwell. 2006. Serotonin a la carte: Supplementation with the serotonin precursor 5-hydroxytryptophan. Pharmacol Ther 109(3): 325-338. PMID 16023217. Retrieved February 19, 2013. Vivian, J. T., and P. R. Callis. 2006. Mechanisms of tryptophan fluorescence shifts in proteins. Biophys J 80(5): 2093-2109. PMID 11325713. Retrieved February 19, 2013. Wurtman, R. J., W. J. Shoemaker, and F. Larin. 1968. Mechanism of the daily rhythm in hepatic tyrosine transaminase activity: Role of dietary tryptophan. Proc Natl Acad Sci USA 59(3): 800-807. PMID 4384464. Retrieved February 19, 2013. Snopes article debunking the turkey–drowsiness connection. This page was last modified on 21 December 2015, at 20:29.